What if you only received two-thirds of your paycheck? You would do everything to figure out where the money is and how to get the rest. Dan Bunting, COO of AeroCare Holdings, faced a similar situation with unpaid patient payments, as his team was only collecting two-thirds of their money owed. It was not for a lack of effort, they were contacting patients, but with little success. Bunting contributes the unpaid payments to not having an efficient billing and collections process and trying to do everything with only their in-house team. “We weren’t doing a great job with patient collections, even though we thought we were experts,” he said. Bunting needed a solution to automate billing and collections, engage patients about their financial responsibilities when they ordered equipment, and secure future co-pays on assets. 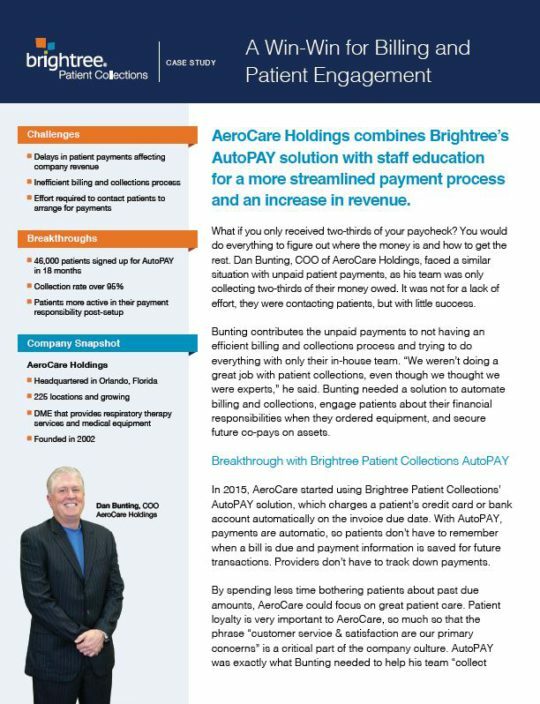 In 2015, AeroCare started using Brightree Patient Collections’ AutoPAY solution, which charges a patient’s credit card or bank account automatically on the invoice due date. With AutoPAY, payments are automatic, so patients don’t have to remember when a bill is due and payment information is saved for future transactions. Providers don’t have to track down payments. During implementation of AutoPAY, AeroCare received extensive training from Brightree’s billing and collections experts. The goal was to support AeroCare to improve the efficiency of its billing and collections process, including how to use AutoPAY and its benefits. One area of training that made an instant impact, Bunting said, was learning how to talk to patients about their financial responsibilities. Brightree Patient Collections provided recommendations and tools (scripts, new financial policy, marketing templates) on what to say about how payments would be collected, signing up for AutoPAY and future transactions. Brightree Patient Collections has also significantly changed the patient-provider relationship for AeroCare, according to Bunting. Much of the communication and payment process is now done without picking up the phone. AutoPAY allowed patients to take a more active role in their financial responsibilities because of the convenience of automated payments. Before AutoPAY, a major headache for AeroCare was getting denied on claims when patients changed insurance and did not inform them. Staff contacted patients and insurance companies, then resubmitted the claims. AutoPAY put an end to that cycle.